A Wolverhampton hospital has installed "talking" CCTV cameras for security staff to pass instructions to staff and the public. 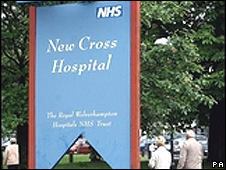 The cameras at New Cross Hospital in Wolverhampton were introduced after many people were failing to use designated smoking shelters. Security staff are able to talk to people they are watching and tell them to use the smoking shelters provided. The CCTV can also inform people that security is on its way to the scene. Graham Argent, divisional manager for estates and facilities at the hospital, said: "These type of systems provide the ability to contact a member of the public or staff without risking direct confrontation." There are five crime incidents a month on average at the hospital, according to official figures. The hospital added that if the cameras are successful, more could be installed around the site.